Hydraulic fracturing in the United Kingdom started in the late 1970s with fracturing of the conventional oil and gas fields of the North Sea. It has been used in about 200 British onshore oil and gas wells since the early 1980s. The technique did not attract attention until licences use were awarded for onshore shale gas exploration in 2008. In the United Kingdom, as in other countries—and in particular the United States, where the industry is most advanced and widespread, hydraulic fracturing has generated a large amount of controversy. Although hydraulic fracturing is often used synonymously to refer to shale gas and other unconventional oil and gas sources, it is not always correct to associate it with unconventional gas. In late May 2011, the first UK exploration for shale gas using high-volume hydraulic fracturing was suspended at Preese Hall in Lancashire after the process triggered two minor earthquakes. The larger of the earthquakes caused minor deformation of the wellbore and was strong enough to be felt. The report of 2012 by the Royal Society and the Royal Academy of Engineering concluded that earthquake risk was minimal, and recommended the process be given nationwide clearance, although it highlighted certain concerns which led to changes in regulations. In January 2014, the European Commission issued a set of recommendations on the minimum principles for the exploration and production of hydrocarbons from shale formations using high-volume hydraulic fracturing. Updated guidance for the public[clarification needed] was issued by the British government in January 2017. In March 2019, the High Court found the UK government's policy was unlawful and failed to consider the climate impact of shale gas extraction. The first experimental use of hydraulic fracturing in the world was in 1947, and the first commercially successful applications of hydraulic fracturing were in 1949 in the United States. There has been significant fracking in the US, where it has allowed electricity to be produced using gas rather than coal, halving the associated CO2 emissions. In the United Kingdom, the first hydraulic fracturing of an oil well was carried out shortly after discovery of the West Sole field in the North Sea in 1965. After the industry started to use intermediate- and high-strength proppants in late 1970s, hydraulic fracturing became a common technique in the North Sea oil and gas wells. The first hydraulic fracturing from ship was conducted in the British Southern North Sea in 1980, with massive or high volume hydraulic fracturing used from 1984 onwards. An estimated 200 conventional onshore wells have been subject to low volume hydraulic fracturing; around 10% of all onshore wells in the United Kingdom, including Wytch Farm, which is the largest onshore conventional oil field in western Europe. The surge of public interest in high-volume hydraulic fracturing in the UK can be traced to 2008, when Cuadrilla Resources was granted a petroleum exploration and development licence in the 13th onshore licensing round for unconventional shale gas exploration along the coast of Lancashire. The company's first and only high-volume hydraulic fracturing job:4 was performed in March 2011, near Blackpool, Lancashire. Cuadrilla halted operations in May 2011 at their Lancashire drilling site due to seismic activity damaging the casing in the production zone. From 1977 until 1994, a hot dry rock geothermal energy experiment was conducted in the Carnmenellis granite of Cornwall. During that experiment, three geothermal wells with depth of 2.6 kilometres (1.6 mi) were hydraulically fractured "to research the hydraulic stimulation of fracture networks at temperatures below 100 °C (212 °F)". Hydraulic fracturing is a well-stimulation technique in which rock is fractured by a hydraulically pressurized fluid. This process is also known as 'fracking'. Hydraulic fracturing requires a borehole to be drilled to target depth in the reservoir. For oil and gas production, hydraulically fractured wells can be horizontal or vertical, while the reservoir can be conventional or unconventional. After the well has been drilled, lined, and geophysically logged, the rock can be hydraulically fractured. There are six stages in hydraulic fracturing: Perforation; Isolation: Stimulation; Flushing; Multi-stage perforation, and; Flowback. In shale plays, the cased well is perforated using "shaped charges (explosives)", which are detonated at selected locations in the production zone. In addition to making perforations in the casing, these detonations also create "finger-like fractures" "up to 2.5 cm in diameter" that "extend up to 60 cm into the formation". In the United Kingdom, geothermal wells normally use barefoot completions, rather than "perforated and cemented completions" within a cased production zone. For both low and high volume hydraulic fracturing stimulation of a hydrocarbon well, a high-pressure fluid (usually water) containing chemical additives and a proppant is injected into a wellbore to create an extensive system of small cracks in the deep-rock formations. These cracks provide the pathway for: natural gas, (including shale gas, tight gas and coalbed methane); petroleum, (including shale or tight oil); to flow more freely. When the hydraulic pressure is removed from the well, the small grains of hydraulic fracturing proppant hold the fractures open when the pressure is released. When a hydrocarbon well is hydraulically fractured, this is done through a production packer (seal), through the drill pipe or tubing. Fluids are circulated down the tubing, to below the point where the packer is sealed against the production casing. Pressure is then be applied only that part of the casing below the packer. The rest of the well casing will not experience any increase in pressure due to the sealing of the packer. The surface casings do not experience the great pressures experienced at the production zone. This means the stresses on a surface casing are no greater than on a normal oil or gas well. Smaller diameter pipes can sustain much larger pressures than large diameter pipes. In HDR geothermal hydraulic fracturing stimulation, proppants are not added to hydraulic fracturing fluid, as the rough-surfaced shear fractures stay open through self-propping. In horizontally drilled sections, it is common to perform as many as 30 separate fracture stages, to evenly divide the production zone. In multi-stage fracturing, segments of a horizontal well, starting at the end furthest from the well head, are split into isolated segments and fractured separately. Flowback fluid contains high levels of salt and is contaminated with organic "solids, heavy metals, fracking chemicals and naturally occurring radioactive material (NORM) of varying concentration and low levels of radioactive materials". The Environment Agency strategy for management of NORM-contaminated flowback fluid, after treatment, includes its preferred re-use by re-injection during hydraulic fracturing and its disposal, with caveats, via water treatment sites. Flowback fluid can be treated and reused in later hydraulic fracturing operations, to reduce the volume of freshwater required and to mitigate issues arising from off-site disposal of flowback fluid. Flowback fluid injection in deep disposal wells, which has been linked to significant increase in earthquake rate, is not currently permitted in the UK by the Environment Agency. Research by Engelder et alia in 2012, indicated that any water injected into a shale formation that does not flow back to the surface, known as "residual treatment water", would be permanently absorbed, (sequestered) into the shale. In January 2014, "applications for permits to frack" were withdrawn by Cuadrilla after arrangements for treatment and disposal of NORM-contaminated flowback fluid were considered inadequate by the Environment Agency. Technologies are developing methods of removing salt and radioactive materials, allowing safe disposal of flowback fluid under Environment Agency licence. Research in the US also indicates new methods such as "microbial capacitive desalination cells" may become available. Polyacrylamide emulsion in hydrocarbon oil (0.043 per cent), which reduces the viscosity of the water to allow faster pumping. It is classed as a "non-hazardous pollutant"
Additional chemical additives that were permitted at Preese Hall 1, but not used, were highly dilute hydrochloric acid and glutaraldehyde, which is used as a biocide in very small quantities, to sterilise the water. Ultraviolet germicidal irradiation is another replacement available for water sterilisation. Although some of the chemicals used in hydraulic fracturing fluids such as hydrochloric acid may be classified as toxic, corrosive or irritant, they are non-toxic at lower concentrations. Other fracturing fluid systems such as gels, foams and compressed gases, including nitrogen, carbon dioxide and air, can be injected in place of water. Waterless fracturing fluids that use propane-based LPG have the potential to reduce wastewater toxicity. :20 There is sometimes a need to hydraulically fracture coalbed methane and these[clarification needed] methods can be used. The hydraulic fracturing process creates a large number of microseismic events, which require monitoring. A 2012 research paper from ReFINE concludes that the maximum recorded fracture height in US shale plays is 588 metres. Only high volume hydraulic fracturing combined with horizontal drilling is likely to enable commercial extraction of unconventional hydrocarbon resources, such as shale gas and light tight oil, in the United Kingdom. The areas where hydraulic fracturing are expected to be used are the Upper Bowland Shale of the Pennine Basin in Lancashire and Yorkshire. and the Jurassic oil-bearing shales of the Weald Basin. The national parks with geologies of possible interest are the North York Moors (shales), the Peak District (shales and coals), the South Downs (shale oil) and to the south of the Yorkshire Dales (shales and coals). Several government agencies, departments and one government company are involved in the regulation of hydraulic fracturing in the United Kingdom: the Oil and Gas Authority (OGA), the Department for Business Energy and Industrial Strategy (BEIS), the local council planning authority including the Minerals Planning Authority (MPA), the Health and Safety Executive and one of four Environment Agencies:2 These environmental agencies are: the Environment Agency for England; National Resources for Wales; the Scottish Environment Protection Agency (SEPA) for Scotland, and; the Northern Ireland Environment Agency (NIEA) for Northern Ireland. Before onshore hydraulic fracturing can begin, an operator will have obtained a landward licence, known as a Petroleum Exploration and Development Licence (PEDL), from the OGA. A series of steps are then taken to obtain permissions from the landowner and council planning authorities. The operator then requests a permit from the Minerals Planning Authority (MPA), who together with the local planning authority, determine if an environmental impact assessment (EIA), funded by the operator, is required. The role of the Health and Safety Executive (HSE) is to focus on the design and integrity of the well, using an independent expert known as the 'well examiner'. The EA and HSE together will "inspect the next series of hydraulic fracturing operations in England and Wales." An hydraulic fracture plan (HFP) is required for both conventional hydraulic fracture well stimulation and unconventional high volume hydraulic well stimulation. The HFP is agreed with OGA in consultation with the EA and HSE. Hydraulic fracturing consent (HFC) is granted following an application to BEIS, to be reviewed by the Secretary of State, and; comply with requirements to mitigate any seismic risks. The UK's four environment agencies do not permit chemical additives for hydraulic fracturing fluids that are classed as hazardous to groundwater, as defined by Schedule 22 of Environmental Permitting (England and Wales) Regulations 2010 (EPR 2010), Schedule 5 of the Pollution Prevention and Control (Scotland) Regulations 2012, and the EU Groundwater Directive (80/68/EEC). The environmental regulator will assess every chemical before it is added to the hydraulic fracturing fluid. The nature of each chemical, but not the concentration, must be made available to the public. The Joint Agencies Groundwater Directive Advisory Group (JAGDAG) maintains a list of substances that have been assessed as being hazardous substances or non-hazardous pollutants for the groundwater directive. Input of hazardous substances "on the basis of their toxicity, persistence and capacity to bio-accumulate" is not permitted into potable or unpotable groundwater. Substances which are not hazardous are potentially non-hazardous pollutants. At the Balcombe site, the Environment Agency permitted one requested chemical oxirane, while not permitting the use of antimony trioxide, which "would be hazardous if it came into contact with groundwater". In March 2014, a group of conservation charities including the RSPB and the National Trust released a report containing a 10-point plan for increased regulation, highlighting their concerns about hydraulic fracturing with respect to groundwater pollution, public water supply, wastewater management and treatment both generally and within ecologically sensitive areas including National Parks. UKOOG, the representative body for the UK onshore oil and gas industry, pointed to "a number of critical inaccuracies" and stated that: "many of the recommendations are already in place in the UK or are in the process of being put in place" and welcomed future dialogue with conservation agencies. In July 2014, the Chartered Institute of Environmental Health (CIEH) and Scientists for Global Responsibility (SGR) published a report about hydraulic fracturing that was broadly negative. It referred to major shortcomings in regulatory oversight regarding local environmental and public health risks, the potential for undermining efforts to tackle climate change, and the possibility that the process might cause water shortages. The report received a negative review from an academic based upon the lead author being a Green Party candidate, and hydraulic fracturing protester, and the alleged selective nature of some[clarification needed] of the data used. In March 2015, the shale company funded Task Force on Shale Gas criticised "current regulation" as "complex and relatively unapproachable", and responsible for the public's lack of confidence. The Task Force on Shale Gas recommended that the regulatory requirement for an operator-funded independent well examiner to be passed to a single, new government regulator, who would also "independently monitor fracking sites". UKOOG, the industry's trade and advocacy group, said: "public confidence in the industry is vital". The government responded: "Both the Health and Safety Executive and the Environment Agency have full authority and responsibility to monitor all shale sites - independent of the industry,"
In June 2015, the UK regulations for hydraulic fracturing were criticised by the chemicals policy charity, CHEM Trust, stating they were not sufficiently protective, and raising concerns about the reductions in funding for the regulators of fracking, like the Environment Agency. UKOOG, responded to the CHEM Trust analysis, criticised the timing of the report: "The timing of this report is clearly designed to influence local councillors" and stated that "The report includes a number of recommendations that are already part of industry common practice or regulation in the UK." and CHEM Trust responded. Community and public engagement is a legal requirement of the EU Directive 2003/35/EC. In June 2013, the industry body UKOOG issued their Shale Community Engagement Charter. The shale gas industry has agreed to two types of community benefit for communities hosting shale gas development, including: a one-off payment of £100,000 per site, after hydraulic fracturing had taken place, and; a 1% share of production revenues; yearly operator commitment publications. In 2014, the government announced its intent to create of a Shale Wealth Fund. The fund was originally intended to be controlled by "community trusts or councils". A consultation period solicited views from stakeholders, "individuals, organisations, such as charities; businesses; local authorities, and; community groups"; ran between August and October 2016. In March 2016, Stephenson Halliday for the Planning Advisory Service noted that the UKOOG local community benefits scheme "fails all three of the tests" in Regulation 122(2) of the Community Infrastructure Levy Regulations 2010. In 2016, the chemical company INEOS committed to a "share 6% of revenues. 4% of this would go to homeowners and landowners in the immediate vicinity of a well, and a further 2% to the wider community." In terms of total revenue, Ineos have estimated that "a typical 10 km by 10 km development area would generate £375m for the community over its lifespan". The Infrastructure Act 2015 legislated onshore access for onshore and offshore extraction of shale/tight oil, shale gas and deep geothermal energy. Section 50 of the act defined the hydraulic fracturing of "shale strata", also known as "high-volume hydraulic fracturing" as "more than 1000m3 of fluid per stage, and; more than 10,000m3 in total" and attached conditions that mean no hydraulic fracturing can take place at a depth shallower than 1000m in unprotected areas. "The Onshore Hydraulic Fracturing (Protected Areas) Regulations 2016" prohibited "hydraulic fracturing in protected areas" - i.e. National Parks of England and Wales, Areas of Outstanding Natural Beauty, the Norfolk and Suffolk Broads, and UNESCO World Heritage sites - at depths of less than 1200m. The environmental risks of hydraulic fracturing in conventional and unconventional wells: ground water contamination, surface water contamination, releases to air, water resource depletion, traffic, land take, noise, visual impact and seismicity. Environmental impact assessments cover a wide range of concerns, including habitat damage, effect on wildlife, traffic, noise, lighting, and air pollution. This reference shows one example. These are presented in less detail in a ' Non Technical Summary'. According to Professor Mair of the Royal Society, the causation of earthquakes with any significant impact or fractures reaching and contaminating drinking water, were very low risk" if adequate regulations are in place. In October 2014, EASAC stated that: "Overall, in Europe more than 1000 horizontal wells and several thousand hydraulic fracturing jobs have been executed in recent decades. None of these operations are known to have resulted in safety or environmental problems". In October 2016, Amec Foster Wheeler Infrastructure Ltd (AFWI) compared the environmental impacts and risks of unconventional high volume hydraulic fracturing with conventional low volume hydraulic fracturing. The study found that volume of fluid injected and flowback were the only significant differences between conventional low volume and unconventional high volume hydraulic fracturing and that the impacts and risks for high volume hydraulic fracturing scaled up for land take, traffic, surface water contamination and water resource depletion. In February 2016, a study by the ReFINE consortium funded by the Natural Environment Research Council (NERC), Shell, Chevron, Ineos and Centrica, found "substantial increases over the baseline""in local air quality pollutants", during the short-duration high-traffic phase which includes the delivery of hydraulic fracturing equipment, proppant, water, as well as the removal of flowback from the site. According to ReFiNE, these short-duration increases have the potential to breach local air quality standards. The industry group UKOOG criticised the ReFiNE study for failing to take into account that water for hydraulic fracturing fluid might be brought in by pipeline, instead of being transported by truck. The RAE report stated, "Many claims of contaminated water wells due to shale gas extraction have been made. None has shown evidence of chemicals found in hydraulic fracturing fluids". The Environment Agency definitions of groundwater and aquifer are here. In January 2015, the British Geological Survey released national baseline methane levels, which showed a wide range of readings Poor surface well sealing, which allows methane to leak, methane was identified in the Royal Academy of Engineering report as a risk to groundwater. This was incorporated into the Infrastructure Act 2015 with a requirement that monitoring takes place 12 months before fracturing. Both low and high volume hydraulic fracturing "involve storing and injecting large quantities of chemicals". Any surface spill therefore has "the potential to penetrate groundwater". The likelihood of low volume and high volume hydraulic fracturing contaminating groundwater by surface spills of stored chemicals is rare, however the risk and consequences are moderate. To mitigate the risk, the Environment Agency requires chemical and fluid proof well pads. The 2012 joint Royal Society and Royal Academy of Engineering report indicated that the distances between potable water supplies and fractured formation in various US shale plays is large, meaning the risk of contamination is very small. No cases of pollution by this route have been identified. Water use is regulated by the EA (England), the SEPA (Scotland), the NIEA (Northern Ireland) and NRW (Wales) to ensure environmental needs are not compromised. Water companies assess how much water is available, before providing it to operators. The amount of water abstracted nationally is at around 9.4 billion cubic metres. In 2015, the EA indicated that water usage at a peak level[clarification needed] would be 0.1% of national use and hydraulic fracturing may use up to "30 million litres per well". Drier areas, such as south-east England, are concerned about the impact of hydraulic fracturing on water supplies. As of August 2016, there have been two cases in the United Kingdom of fault reactivation by hydraulic fracturing that caused induced seismicity strong enough to be felt by humans at the surface: both in Lancashire (M 2.3 and M 1.5). In October 2018, more earthquakes were recorded in Lancashire including two tremors of 0.8 magnitude which called the Energy firm Cuadrilla to call a temporary halt on the drilling operations. In May 2011, the government suspended Cuadrilla's hydraulic fracturing operations in their Preese Hall 1 well in Lancashire, after two small earthquakes were triggered, one of magnitude M 2.3. The largest coseismic slip caused minor deformation of the wellbore and was strong enough to be felt. In an answer to questions from the 'Lets talk about Shale' initiative, run by Westbourne Communications for the industry body, UKOOG, they have stated "According to the Association of British Insurers there is, at present, little evidence of a link between shale gas and property damage, and they are not aware of any claims where seismic activity as a result of fracking has been cited as a cause of damage. Damage as a result of earthquakes, subsidence, heave and landslip are all covered, in general, under buildings insurance. Insurers will continue to monitor the situation for the potential for fracking, or similar explorations, to cause damage." In March 2017, the Chartered Insurance Institute (CII) released a report by the CII Claims Faculty New Generation Group, which explored the Insurance implications of fracking. The authors examined the "key perils associated with fracking such as earthquakes, explosions and fire, pollution, injury and death", and found that while "most insurances policies" provided "cover for these risks", "fracking will pose additional complications around liability". The authors also considered that if widespread fracking were to lead to increased claims, "then insurers may have to consider how they underwrite this emerging higher-risk group". The authors recommended: working together within the insurance profession "to monitor and discuss the issues" while remaining "open and transparent about the risks of fracking", and; working with the "energy industry and the government" "to reduce the likelihood of potential risks occurring". The CII emphasised that "insurers need to be prepared for claims in the event of a fracking-related loss and consider policy wordings with increased fracking in mind". In 2014, Public Health England reviewed the "available evidence on issues including air quality, radon gas, naturally occurring radioactive materials, water contamination and waste water. They concluded that the risks to public health from exposure to emissions from shale gas extraction are low if operations are properly run and regulated." Public Health England's Dr John Harrison, Director for Radiation, Chemical and Environmental Hazards, stated that: "Where potential risks have been identified in other countries, the reported problems are typically due to operational failure. Good on-site management and appropriate regulation of all aspects of exploratory drilling, gas capture as well as the use and storage of hydraulic fracturing fluid is essential to minimise the risks to the environment and health." In 2015 the health charity Medact published a paper written by two public health specialists called 'Health & Fracking - The impacts and opportunity costs', which reviewed health impacts of hydraulic fracturing and suggested a moratorium until a more detailed health and environmental impact assessment could be completed. UKOOG criticised Medact's understanding of UK regulations and said they had not declared that one of its consultants, who was standing for parliament in the 2015 general election, had a conflict of interest. The Times journalist Ben Webster also criticised Medact for not declaring one of their consultant's conflict of interest and reported that the Medact director had not realised that this consultant was also an anti-fracking candidate. MedAct published a response to these criticisms. The content of the Medact Report 2015 was referred to by many objectors in the June 2015 Public reports pack for the Lancashire County Council Development Control Committee. Lancashire County Council were uncertain how much weight to attach to the Medact report due to "questions from some quarters" about the objectivity of the report based on association of two its contributors with campaigns relating to shale gas. In 2016, Medact released an updated public health report, citing health risks from shale gas development and calling upon the government to "abandon its shale gas plans". 18 August 2013: Fracking protest south of Balcombe, Sussex, England. Hydraulic fracturing, "or 'fracking' as it has become commonly known, is a big issue for local authorities and communities across the country" and has become part of the Climate Change debate. Concerns about hydraulic fracturing have been raised across the United Kingdom, including: Sussex, Somerset and Kent in England, and; the Vale of Glamorgan in Wales. In 2011, Bath and North East Somerset Council voiced concerns that hydraulic fracturing could contaminate Bath's famous hot springs. Protests have been held against onshore unconventional fossil fuel exploration that may lead to hydraulic fracturing. In 2012, industry assurances were tarnished when Cuadrilla came under fire for its categorical denials of its plans for hydraulic fracturing near Balcombe after documents from parent company AJ Lucas materialised appearing to indicate the opposite. In 2014, a Cuadrilla scrapped its plans to frack at Balcombe. In May 2014, a letter to the Department of Energy and Climate Change dated June 2011 emerged, confirming the company believed that to achieve commercial production, "significant amounts of hydraulic fracturing" would be required at Balcombe. There are a number of anti-fracking groups, which range from the nationwide Frack Off, which was engaged in the Balcombe drilling protest, to local groups such as Residents Action on Fylde Fracking, Ribble Estuary Against Fracking, NO Fracking in Sussex, Frack Free Fernhurst and The Vale Says No! Environmental NGOs Greenpeace, World Wide Fund for Nature (WWF) and Friends of the Earth are also against fracking. Anti-fracking campaigners say that there are various problems associated with the process including pressure on local transport infrastructure, air and water pollution, the amounts of water used, and potential economic damage to agricultural, food production and tourism industries. Pro-fracking campaigners such as the Centrica-backed group North West Energy Task Force say the "fracking industry" "could bring a boost to jobs and the economy" and that "shale gas has a pivotal role to play in the region's future success" and "would act as a catalyst to bring the vital investment necessary to secure existing industries and develop new ones." Anti-fracking and pro-fracking campaigners have submitted a series of complaints about advertisements, brochures and leaflets to the Advertising Standards Agency. In August 2014, a report called 'Shale Gas:Rural Economic Impacts' was published by the UK Government, in response to a Freedom of Information request, from Greenpeace. It was due for publication in March 2014. It was notable as large parts of this had been redacted, leading to criticism about the transparency of information being provided. ^ a b c d e f g h Mair, Robert (June 2012). Shale gas extraction in the UK: A review of hydraulic fracturing (PDF) (Report). The Royal Society and the Royal Academy of Engineering. Retrieved 10 October 2014. ^ British Geological Survey (2010). The Unconventional Hydrocarbon Resources of Britain's Onshore Basins - Shale Gas (PDF). Republished 2012. Department of Energy and Climate Change. Retrieved 17 April 2013. ^ a b Kahya, Damian (20 January 2011). "Can Europe benefit from shale gas?". BBC News. Retrieved 6 September 2016. Attention is focused on little-known Cuadrilla Resources and its well in Lancashire, where it plans a test drill soon. ^ "What is fracking and why is it controversial?". BBC. 16 December 2015. Retrieved 20 December 2016. ^ Reid, Alasdair (24 October 2013). "Unconventional Gas in Scotland" (PDF). SPICe Briefing. SPICe. 68 (13). Retrieved 8 November 2014. ^ a b c DECC (February 2014). "Fracking UK shale: understanding earthquake risk" (PDF). Archived from the original (PDF) on 9 October 2015. Retrieved 31 August 2016. ^ a b Harvey, Fiona; Carrington, Damian; Macalister, Terry (13 March 2013). "Fracking company Cuadrilla halts operations at Lancashire drilling site". Retrieved 24 August 2016. ^ a b White, Garry (2 November 2011). "Cuadrilla admits drilling caused Blackpool earthquakes". Retrieved 24 August 2016. ^ a b "Onshore oil and gas exploration in the UK: regulation and best practice" (PDF). Department of Energy and Climate Change. December 2013. Retrieved 10 October 2014. ^ 2014/70/EU: Commission Recommendation of 22 January 2014 on minimum principles for the exploration and production of hydrocarbons (such as shale gas) using high-volume hydraulic fracturing. EUR-Lex: Access to European Law (Report). EU Commission. 22 January 2014. Retrieved 23 August 2016. ^ a b c d e "Guidance on fracking: developing shale gas in the UK". Department for Business, Energy & Industrial Strategy (BEIS). 13 January 2017. Retrieved 13 September 2016. ^ "Government fracking policy declared unlawful by High Court". The Independent. 6 March 2019. Retrieved 6 March 2019. ^ Montgomery, Carl T.; Smith, Michael B. (December 2010). "Hydraulic fracturing. History of an enduring technology" (PDF). JPT Online. Society of Petroleum Engineers: 26–41. Archived from the original (PDF) on 27 September 2011. Retrieved 13 May 2012. ^ "What is fracking?". 15 October 2018. Retrieved 6 March 2019 – via www.bbc.co.uk. ^ Mader, Detlef (1989). Hydraulic Proppant Fracturing and Gravel Packing. Elsevier. pp. 174, 250. ISBN 9780444873521. ^ "Decision to extend oil production at Wytch Farm 'illogical', say green campaigners" (PDF). 9 September 2013. Retrieved 26 December 2016. We believe that the current public concern about 'fracking' relates to extensive, high pressure, hydraulic fracturing using high-volumes of liquid in very low permeability rock to extract gas from shale, and methane from coal-beds. High volume hydraulic fracturing of this type has not been carried out at Wytch Farm. In the meantime, we look forward to maintaining the highest operating standards and making a positive economic and social contribution to the area. ^ Westcott, Catherine (31 July 2014). "UK Parliament Announces the 14th Landward Licensing Round". Inside Energy & Environment. Retrieved 23 December 2016. ^ "Blackpool shale gas drilling begins". BBC News. 28 March 2011. Retrieved 29 February 2012. ^ Charles Hendry (22 September 2011). "The potential for shale gas is worth exploration". guardian.co.uk. Retrieved 26 February 2012. ^ Terry Macalister (13 March 2013). "Fracking company Cuadrilla halts operations at Lancashire drilling site". guardian.co.uk. Retrieved 7 October 2014. ^ a b Busby, Jon (25–29 April 2010). "Geothermal Prospects in the United Kingdom" (PDF). Proceedings World Geothermal Congress. Bali, Indonesia. Retrieved 1 May 2013. ^ a b c d e f Cuss, RJ; Wiseall, CA; Hennissen, JAI; Waters, CN; Kemp, SJ; Ougier-Simonin, A; Holyoake, S; Haslam, RB (25 November 2015). Hough, E; Stephenson, MH (eds.). "Hydraulic Fracturing: A review of theory and field experience" (PDF). Energy & Marine Geoscience Programme Open Report OR/15/066. BRITISH GEOLOGICAL SURVEY. Retrieved 31 March 2017. ^ Glauser, Walter; McLennan, John; Walton, Ian (17 May 2013). "17, Do Perforated Completions Have Value for Engineered Geothermal Systems". In Bunger, Andrew P.; McLennan, John; Jeffrey, Rob (eds.). Effective and Sustainable Hydraulic Fracturing. ISBN 978-953-51-1137-5. Retrieved 2 April 2017. ^ "Successful Perforation Operation Experience in a Geothermal Well of Salavatli Geothermal Field" (PDF). PROCEEDINGS, Fourtieth Workshop on Geothermal Reservoir Engineering Stanford University, Stanford, California, January 26–28, 2015, Stanford University. January 2015. Retrieved 2 April 2017. ^ Mitchell, Clive. "UK silica sand resources for fracking" (PDF). Natural Environment Research Council. British Geological Survey and Natural Environment Research Council. Retrieved 30 March 2017. ^ "How Does A Swellable Packer Work?". Rigzone Training: How it works. Retrieved 31 August 2016. ^ Almond, S.; Clancy, S. A.; Davies, R. J.; Worrall, F. (2014). "The flux of radionuclides in flowback fluid from shale gas exploitation". Environmental Science and Pollution Research. 21 (21): 12316–24. doi:10.1007/s11356-014-3118-y. PMC 4200344. PMID 24938807. ^ "4.7". Strategy for the management of Naturally Occurring Radioactive Material (NORM) waste in the United Kingdom (PDF) (Report). p. 30. Retrieved 2 September 2016. Treatment and disposal may take place by re-injection during subsequent hydraulic fracturing, or it may be carried out at sites remote from the shale gas production facilities, for example sewage or effluent treatment sites and would be expected to remove up to 90% of NORM; only very low levels would still remain. After treatment, the water may still retain some of this natural radioactivity and disposal to rivers, estuaries, sea or groundwater may lead to intakes of radioactivity through consumption of drinking water and contaminated foodstuffs, or by direct exposure pathways. ^ Green, Dr Christopher A.; Styles, Professor Peter; Baptie, Dr Brian J. (April 2012). Preese Hall Shale Gas Fracturing Review & Recommendations for Induced Seismic Mitigation (PDF) (Report). p. 22. Retrieved 5 September 2016. ^ Peterson, Mark D.; Mueller, Charles S.; Moschetti, Morgan P.; Hoover, Susan M.; Llenos, Andrea L.; Ellsworth, William L.; Michael, Andrew J.; Rubinstein, Justin L.; McGarr, Arthur F.; Rukstales, Kenneth S. (June 2016). 2016 One-Year Seismic Hazard Forecast for the Central and Eastern United States from Induced and Natural Earthquakes (PDF) (Report). 1.1. United States Geological Survey. Retrieved 2 September 2016. ^ Craig, Patricia (10 September 2014). "Residual hydraulic fracturing water not a risk to groundwater". Retrieved 11 September 2014. ^ "Cuadrilla fracking delays over radioactive waste water". BBC News. 27 January 2014. Retrieved 24 October 2014. The Environment Agency (EA) said it would not grant a radioactive substances permit until it was sure the water will be disposed of safely. ^ Altaee, Ali; Hilal, Nidal (2014). "Dual-stage forward osmosis/pressure retarded osmosis process for hypersaline solutions and fracking wastewater treatment". Desalination. 350: 79–85. doi:10.1016/j.desal.2014.07.013. ^ Bowley, Elisabeth (5 November 2014). "Energy positive treatment for fracking water". Chemistry World. Retrieved 27 February 2017. ^ a b "Fracturing fluids and additives". PetroWiki.org. SPE International. Retrieved 16 October 2014. ^ Cuadrilla Resources Ltd. "Composition of Bowland Shale Hydraulic Fracturing Fluid for Preese Hall-1 well". Archived from the original on 16 September 2016. Retrieved 4 April 2017. ^ "Substance determinations" (PDF). Water Framework Directive. JAGDAG/Environment Agency. Retrieved 28 March 2017. ^ Hardy, Peter (1 January 2014). "CHAPTER 1. Introduction and Overview: the Role of Shale Gas in Securing Our Energy Future". Fracking. Issues in Environmental Science and Technology. Royal Society of Chemistry. pp. 1–45. doi:10.1039/9781782620556-00001. ISBN 978-1-84973-920-7. Retrieved 28 March 2017. The fracturing fluid that Cuadrilla has used at the Preese Hall exploration well site, and plans to use at future exploration well sites, is composed almost entirely of fresh water and sand. Cuadrilla also has approval to use the following additives: Polyacrylamide (friction reducer) Sodium salt (for tracing fracturing fluid) Hydrochloric acid (diluted with water) Glutaraldehyde biocide (used to cleanse water and remove bacteria) So far, as additives to fracturing fluid, Cuadrilla has only used polyacrylamide friction reducer along with a minuscule amount of salt, which acts as a tracer. Cuadrilla have not needed to use biocide as the water supplied by United Utilities to their Lancashire exploration well sites has already been treated to remove bacteria, nor have they used diluted hydrochloric acid in fracturing fluid. Additives proposed, in the quantities proposed, have resulted in the fracturing fluid being classified as non-hazardous by the Environment Agency. ^ Bomgardner, Melody M. (13 April 2015). "Better Chemistry Flows To The Oil And Gas Industry | April 13, 2015 Issue - Vol. 93 Issue 15 | Chemical & Engineering News". Cen.acs.org. Archived from the original on 28 March 2017. Retrieved 28 March 2017. One of Dow's leading microbicides, glutaraldehyde, is a favorite among those formulating low-toxic fracking fluids. Although it is classified as acutely toxic and requires safe-handling procedures similar to bleach, glutaraldehyde has a fan in Apache's Durham because "it has very little chronic toxicity and fares very well in bioaccumulation and biodegradation testing. ^ "Compendium of Hazardous Substances: Hydrogen Chloride/Hydrochloric Acid Incident Management" (PDF). June 2016. Retrieved 3 April 2017. ^ "Fracturing fluid systems" (PDF). Halliburton. 2013. Retrieved 16 October 2014. ^ Gurule, Kendall (9 July 2013). "Nitrogen gas fracking". frackwire. Retrieved 16 October 2014. ^ "Waterless fluid solutions". GasFrac Energy Services. Archived from the original on 16 October 2014. Retrieved 16 October 2014. ^ Batley Kookana. "Environmental issues associated with coal seam gas recovery: managing the fracking boom". CSIRO Publishing. Retrieved 15 February 2017. ^ Davies; et al. "Hydraulic fractures: How far can they go?" (PDF). ReFine. p. 1. Retrieved 22 February 2017. "The maximum reported height of an upward propagating hydraulic fracture from several thousand fracturing operations in the Marcellus, Barnett, Woodford, Eagle Ford and Niobrara shale (USA) is 588 m. Based on these empirical data, the probability of a stimulated hydraulic fracture extending vertically less than 350 m is less than 1%. Constraining the probability of stimulating unusually tall hydraulic fractures in sedimentary rocks is extremely important as an evidence base for decisions on the safe vertical separation between the depth of stimulation and rock strata not intended for penetration". ^ Microseismic Knowledgebase. "Microseismic Monitoring 101". ESG Solutions. Retrieved 31 August 2016. ^ "Regulation of exploratory shale gas operations: guidance note" (PDF). Environment Agency. 27 November 2012. Retrieved 12 September 2016. ^ "Developing Onshore Shale Gas and Oil–Facts about 'Fracking'" (PDF). Department of Energy and Climate Change. December 2013. Retrieved 7 November 2014. ^ a b "Unconventional Gas" (PDF). POSTnote. Parliamentary Office of Science and Technology (374). April 2011. Retrieved 8 November 2014. ^ British Geological Survey (2014). "Weald Basin Summary: Unconventional Resources in Great Britain -Weald Basin Jurassic BGS Study" (PDF). DECC. Retrieved 26 March 2017. ^ Herringshaw, Dr Liam (March 2015). "From national to fracktional: will fracking come to Britain's National Parks?" (PDF). Durham Energy Institute, Durham University. Retrieved 12 September 2016. ^ Eden Project. "Eden Deep Geothermal Energy Project". Retrieved 17 October 2014. ^ "Oil and Gas Authority to become new independent regulator". Infrastructure Intelligence. Retrieved 8 April 2017. From 1 October 2016, the Oil and Gas Authority (OGA) will be an independent regulator for the UK government, with a new set of powers to fulfil government expectations for the oil and gas industry. ^ "Hydraulic Fracturing Regulatory Process" (PDF). Oil and Gas Authority. Retrieved 8 April 2017. ^ a b c d e "Onshore Oil & Gas Sector Guidance Version 1, 17 August 2016" (PDF). Environment Agency. 17 August 2016. Retrieved 3 September 2016. ^ "Natural Resources Wales". Retrieved 16 October 2014. ^ "Scottish Environment Protection Agency". SEPA. Retrieved 16 October 2014. ^ "Environmental Permitting Regulations (EPR) 2010". Retrieved 14 September 2016. 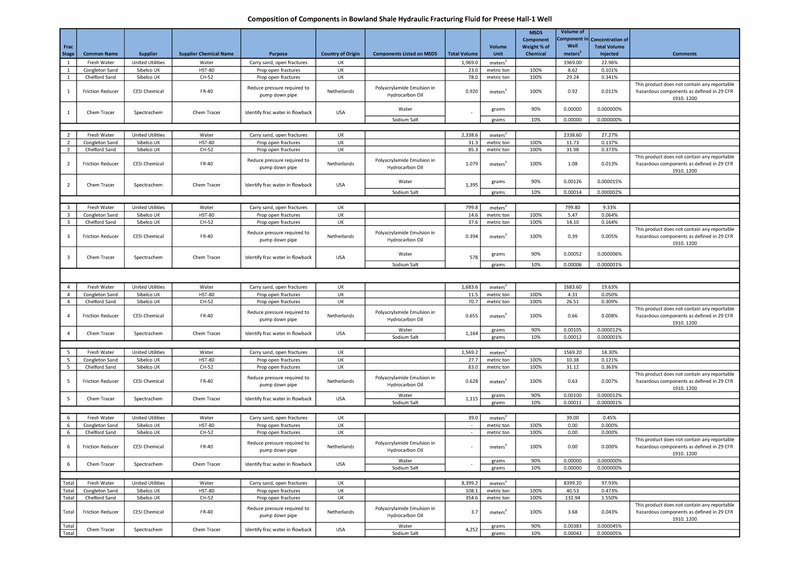 ^ "HSE Shale requirements" (PDF). Archived from the original (PDF) on 1 March 2014. Retrieved 24 February 2014. ^ "HSE's role in regulating onshore shale gas and hydraulic fracturing". ^ "The Environment Agency and the Health and Safety Executive: Working together to regulate unconventional oil and gas developments" (PDF). November 2012. Archived from the original (PDF) on 28 March 2014. ^ a b "Guidance for EWTs and HFPs: Hydraulic Fracture Plan (HFP)" (PDF). Oil and Gas Authority Ltd. 5 January 2017. pp. 2, 3. Retrieved 8 April 2017. ^ "HYDRAULIC FRACTURING CONSENT" (PDF). Guidance on application for hydraulic fracturing consent (HFC) under section 4A of the Petroleum Act 1998 (inserted by section 50 of the Infrastructure Act 2015). UK Govt. 16 February 2017. ^ "The Environmental Permitting (England and Wales) Regulations 2010". UK Government. 2010. Retrieved 28 August 2016. ^ "The Pollution Prevention and Control (Scotland) Regulations 2012". Legislation.gov.uk. Queen's Printer for Scotland (QPS). Retrieved 1 April 2017. ^ "DIRECTIVE 2006/118/EC OF THE EUROPEAN PARLIAMENT AND OF THE COUNCIL of 12 December 2006 on the protection of groundwater against pollution and deterioration". Eur-lex.europa.eu. EUR-Lex - 32006L0118 - EN - EUR-Lex. 12 December 2006. Retrieved 18 October 2014. It is necessary to distinguish between hazardous substances, inputs of which should be prevented, and other pollutants, inputs of which should be limited. Annex VIII to Directive 2000/60/EC, listing the main pollutants relevant for the water environment, should be used to identify hazardous and non-hazardous substances which present an existing or potential risk of pollution. ^ "170116 Substance Determinations final" (PDF). JAGDAG/Environment Agency. Retrieved 16 March 2017. ^ "Chapter 4" (PDF). Environmental Permitting Guidance Groundwater Activities. Environmental Permitting. DEFRA. p. 15. Retrieved 16 March 2017. 4.6 The List I and List II groupings of substances under the GWD and 1998 Regulations no longer apply. Substances are instead treated as either 'hazardous substances' (initially broadly equating to the former List I) or non-hazardous pollutants' (analogous to the former List II, but potentially applying to all other pollutants) 'Hazardous substance' is defined in Article 2(29) of the Water FD as meaning substances or groups of substances that are toxic, persistent and liable to bio-accumulate, and other substances or groups of substances which give rise to an equivalent level of concern. The GWDD requires a different approach by which Member States or their competent authorities determine which substances should be determined as hazardous on the basis of their toxicity, persistence and capacity to bio-accumulate – i.e. positive determination rather than removal from a pre-determined list. This provides greater flexibility to include substances within, or alternatively exclude them from, the 'hazardous' category. In practice substances which have been determined as List I will continue to be regarded as hazardous and will only be reviewed if new evidence becomes available. ^ Harvey, Fiona; Vaughan, Adam (10 October 2013). "Fracking firm was barred from using chemical, Balcombe meeting told". The Guardian. Retrieved 5 September 2014. ^ "Are we fit to frack?". RSPB. 20 March 2014. 5.Make water companies statutory consultees in the planning process. 6. Require all hydraulic fracturing operations to operate under a Groundwater Permit. 7.Make sure Best Available Techniques (BAT) for mine waste management are rigorously defined and regularly reviewed. ^ "UKOOG Fit to Frack response". Ukoog.org.uk. 14 March 2014. UK Onshore Oil and Gas, the representative body of the UK's onshore oil and gas industry, notes the contribution made by leading conservation charities to the debate on shale gas regulation in their report: "Are We Fit To Frack." Of the 10 recommendations in the report, the vast majority are already in place or are in discussion. We look forward to being able to discuss with the six bodies who contributed to this report about the best way forward so that we ensure all misconceptions about the shale gas industry in the UK can be addressed. Ken Cronin Chief Executive UKOOG commented "We have studied this report and the fact that many of the recommendations are already in place in the UK or are in the process of being put in place. We hope that the publication of this report, despite a number of critical inaccuracies, will kickstart a process of open dialogue which we have already proposed to conservation agencies. ^ Verdon, James (23 July 2014). "Critique authored by Dr James Verdon of the report, authored by the Chartered Institute for Environmental Health, on hydraulic fracturing (fracking) and shale gas extraction in the UK". Scribd. Retrieved 16 October 2014. ^ "HSE's role in regulating onshore shale gas and hydraulic fracturing - Shale gas- HSE". Hse.gov.uk. Retrieved 5 April 2017. the Offshore Installations and Wells (Design and Construction etc) Regulations 1996, known as DCR. These regulations, include specific requirements for all wells, whether onshore or offshore, and include well integrity provisions which apply throughout the life of shale gas wells. They also require a well operator to provide HSE with regular reports of any activities on the well and to appoint an independent well examiner to undertake regular assessments of well integrity. ^ "New fracking regulator needed, report says". 25 March 2015. Retrieved 5 April 2017. Lord Smith said: "He said the new regulator would also involve the local community in the monitoring process and assess the integrity of wells to make sure any problems that could lead to leaks are discovered and remedied." ^ CHEM Trust (21 June 2015). "Chemicals from fracking could cause significant pollution and damage to wildlife". Retrieved 29 July 2015. ^ Rowell, Andy (20 June 2015). "Fracking poses a 'significant' risk to humans and wildlife, says a new report: A major scientific study says the process uses toxic and carcinogenic chemicals and that an EU-wide ban should be issued until safeguards are in place". The Independent. Retrieved 8 September 2016. ^ UKOOG (22 June 2015). "UKOOG Response to Chemtrust report on Fracking". Retrieved 1 August 2015. ^ CHEM Trust (23 June 2015). "Fracking pollution: A response to the claims made by the UK fracking industry". Retrieved 1 August 2015. ^ Gosden, Emily (22 June 2015). "Anti-fracking report cited by Andy Burnham was based on 'scare stories'". The Daily Telegraph. Retrieved 8 September 2016. ^ Scottish Government (31 January 2017). "Talking Fracking - A Consultation on Unconventional Oil and Gas". Gov.scot. p. 338009. Retrieved 31 March 2017. ^ "Directive 2003/35/EC of the European Parliament and of the Council of 26 May 2003 providing for public participation in respect of the drawing up of certain plans and programmes relating to the environment and amending with regard to public participation and access to justice Council Directives 85/337/EEC and 96/61/EC - Statement by the Commission". Eur-lex.europa.eu. EUR-lex. 26 May 2003. Retrieved 31 March 2017. ^ "Shale gas: George Osborne proposes north of England fund". BBC News. 8 November 2014. Retrieved 31 March 2017. ^ "PM rewrites plan to put money from infrastructure in the hands of local people". gov.uk. 7 August 2016. Retrieved 30 March 2017. ^ Stephenson Halliday (March 2016). "FINANCIAL MATTERS: PLANNING FOR SHALE GAS AND OIL – BRIEFING NOTE MARCH 2016" (PDF). Local.gov.uk. p. 26. Retrieved 16 December 2017. ^ "COMMUNITY AND THE INEOS PROMISE" (PDF). INEOS. Retrieved 25 February 2017. ^ a b Stephenson Halliday for PAS (March 2016). "Planning for Shale Gas and Oil - Briefing Note March 2016". Planning Advisory Service. Retrieved 22 December 2016. ^ Controller of HMSO. "Infrastructure Act Section 43: Petroleum and geothermal energy: right to use deep-level land". Her Majesty's Stationery Office (HMSO). Retrieved 28 August 2016. ^ Controller of HMSO. "Infrastructure Act Section 50:Onshore hydraulic fracturing: safeguards". Her Majesty's Stationery Office (HMSO). Retrieved 24 March 2017. ^ Controller of HMSO. "The Onshore Hydraulic Fracturing (Protected Areas) Regulations 2016: Regulation 3". Her Majesty's Stationery Office (HMSO). Retrieved 27 February 2017. ^ a b AMEC Environment & Infrastructure UK (December 2013). Strategic environmental assessment for further onshore oil and gas licensing (PDF) (Report). Oil and Gas Policy Unit, DECC. 33917mr007i3. Retrieved 16 October 2014. ^ "Potential environmental considerations associated with shale gas". British Geological Survey. NERC. Retrieved 21 October 2014. ^ Shale gas extraction: issues of particular relevance to the European Union (PDF) (Report). European Academies Science Advisory Council. October 2014. Retrieved 10 December 2014. This EASAC analysis provides no basis for a ban on shale gas exploration or extraction using hydraulic fracturing on scientific and technical grounds, although EASAC supports calls for effective regulations in the health, safety and environment fields highlighted by other science and engineering academies and in this statement. ^ a b Amec Foster Wheeler Infrastructure Ltd (October 2016). "Study on the assessment and management of environmental impacts and risks resulting from the exploration and production of hydrocarbons" (PDF). European Commission. Retrieved 9 April 2017. ^ Goodman, Paul S.; Galatioto, Fabio; Thorpe, Neil; Namdeo, Anil K.; Davies, Richard J.; Bird, Roger N. (1 April 2016). "Investigating the traffic-related environmental impacts of hydraulic-fracturing (fracking) operations". Environment International. 89-90: 248–260. doi:10.1016/j.envint.2016.02.002. ^ Vaughan, Adam (24 February 2016). "UK fracking traffic would increase local air pollution, finds study". The Guardian. Retrieved 9 April 2017. Additionally the report’s conclusions fail to take into account, that in the UK, water is more often available through pipelines, so there is no need to transport it across the country by truck. ^ "Chapter 2". Protect groundwater and prevent groundwater pollution. Environment Agency. Retrieved 16 March 2017. Water stored below the ground in rocks or other geological strata is called groundwater. The geological strata that hold water are called aquifers. Groundwater may rise to the surface through naturally occurring springs, or be abstracted using boreholes and wells. Groundwater may also naturally flow into rivers (called base flow) and support wetlands, forming part of local ecosystems.The legal definition of groundwater is: 'All water which is below the surface of the ground in the saturation zone and in direct contact with the ground or subsoil. 'Aquifers are: 'A subsurface layer or layers of rock or other geological strata of sufficient porosity and permeability to allow either a significant flow of groundwater or the abstraction of significant quantities of groundwater. ^ "Results summary - National methane baseline survey of UK groundwaters - British Geological Survey (BGS)". Bgs.ac.uk. Retrieved 6 March 2019. ^ "2015 Infrastructure Act". UK Legislation. Retrieved 13 September 2016. ^ "Shale Gas and Water 2016 An independent review of shale gas extraction in the UK and the implications for the water environment" (PDF). Ciwem.org. CIWEM. Retrieved 31 August 2016. ^ Amec Foster Wheeler Environment & Infrastructure UK Ltd (October 2016). "Study on the assessment and management of environmental impacts and risks resulting from the exploration and production of hydrocarbons" (PDF). European Commission. p. 277. Retrieved 1 April 2017. ^ Boothroyd, I.M. ; Almond, S.; Qassim, S.M. ; Worrall, F.; Davies, R.J. (2016). "Fugitive emissions of methane from abandoned, decommissioned oil and gas wells". Science of the Total Environment. 547: 461–9. doi:10.1016/j.scitotenv.2015.12.096. PMID 26822472. ^ Chief Inspector of Drinking Water (July 2013). Drinking water 2012: Private water supplies in England (PDF) (Report). Drinking Water Inspectorate. Retrieved 16 October 2014. ^ CIWEM (February 2016). "Shale Gas and Water 2016" (PDF). The Chartered Institution of Water and Environmental Management (CIWEM). p. 32. Retrieved 24 March 2017. ^ DEFRA (16 March 2017). "Water Abstraction statistics, England 2000 to 2015" (PDF). Department for Food and Rural Affairs (DEFRA). Retrieved 23 March 2017. ^ Environment, Agency. "Written evidence submitted by the Environment Agency". Environment Agency. Retrieved 7 January 2015. ^ Fiona Harvey (27 November 2013). "Water shortages may make fracking impractical, industry says: Quantities required for the fracking process may make it problematic in areas of the UK where resources are scarce". The Guardian. Retrieved 25 March 2017. Water UK told the Guardian there could be risks to the water supply particularly in the south-east, where the pressure of population puts supplies under stress. ^ British Geological Survey. "Earthquakes induced by Hydraulic Fracturing Operations near Blackpool, UK". Earthquakes.bgs.ac.uk. Retrieved 29 December 2016. ^ Wilson, Miles P.; Davies, Richard J.; Foulger, Gillian R.; Julian, Bruce R.; Styles, Peter; Gluyas, Jon G.; Almond, Sam (2015). "Anthropogenic earthquakes in the UK: A national baseline prior to shale exploitation". Marine and Petroleum Geology. 68: 1–17. doi:10.1016/j.marpetgeo.2015.08.023. ^ "Fracking suspended following earthquake". BBC News. 26 October 2018. Retrieved 27 October 2018. ^ "Fracking in Lancashire: Second 0.8 tremor in 24 hours". BBC News. 27 October 2018. ^ a b Sylvia Pfeifer and Elizabeth Rigby (1 June 2011). "Earthquake fears halt shale gas fracking". The Financial Times. Retrieved 1 March 2012. ^ "Shale gas drilling update". Mark Menzies' website. 5 June 2011. Retrieved 1 March 2012. ^ "Shale gas fracking: MPs call for safety inquiry after tremors". BBC News. 8 June 2011. Retrieved 26 February 2012. ^ "PH1Frac review" (PDF). Retrieved 6 March 2019. ^ Fiona Harvey (17 April 2012). "Gas 'fracking' gets green light". The Guardian. Retrieved 17 April 2012. ^ Matt McGrath, Fracking: Untangling fact from fiction, BBC, 13 December 2012. ^ de Pater, C.J. ; Baisch, S. (2 November 2011). Geomechanical Study of Bowland Shale Seismicity (PDF). Cuadrilla Resources. Retrieved 22 February 2012. ^ Rearden, Sarah (2 November 2011). "U.K. Quakes Likely Caused by Fracking". HighWire Press, American Association for the Advancement of Science. Archived from the original on 3 November 2011. Retrieved 26 February 2012. ^ "Fracking tests near Blackpool 'likely cause' of tremors". BBC News. 2 November 2011. Retrieved 26 February 2012. ^ "Fracking and Earthquake Hazard". British Geological Survey. Retrieved 2 September 2016. ^ About shale gas and hydraulic fracturing (fracking) (Report). Department of Energy and Climate Change. 19 December 2013. Archived from the original on 24 August 2013. Retrieved 30 August 2013. ^ "Lets talk about shale". UKOOG. Archived from the original on 7 March 2017. Retrieved 6 March 2017. ^ "Doniya Soni". LinkedIn. Retrieved 4 June 2017. Website and feedback management for ‘Let’s Talk about Shale’ – an UKOOG initiative where more than 8,000 stakeholders were engaged with. ^ "Does home insurance covers any damage caused by shale gas extraction?". UKOOG. Archived from the original on 7 March 2017. Retrieved 6 March 2017. ^ Ben, Briggs. "NFU Mutual clarifies its position on fracking insurance". Farmers Guardian. Archived from the original on 31 January 2015. Retrieved 19 February 2015. ^ Chartered Insurance Institute Claims Faculty New Generation Group (March 2017). "Insurance implications of fracking" (PDF). Retrieved 15 May 2017. ^ "Insurance implications of fracking". Cii.co.uk. Chartered Insurance Institute. Retrieved 14 May 2017. ^ McCoy, Dr David; Saunders, Dr Patrick (2015). "Health & Fracking - The impacts and opportunity costs" (PDF). Medact. Retrieved 20 June 2015. ^ "Shale gas industry says that Medact Report fails to understand UK regulatory system and lacks credibility". UKOOG. Retrieved 20 June 2015. ^ Webster, Ben (31 March 2015). "A report that persuaded doctors to oppose fracking was partly written by a campaigner opposing shale gas extraction near his home". The Times. Retrieved 28 August 2016. ^ "Rebutting and Responding to Criticisms of the Medact Report on Fracking and Health" (PDF). Medact. Retrieved 20 June 2015. ^ "Public reports pack 23 June 2015" (PDF). Lancashire County Council Development Control Committee. pp. 723–724. Retrieved 20 June 2015. PHE did not comment on the Medact report in this document. The Council commented: Many objectors refer to the 2015 report of the public health charity Medact. Medact say the risks and serious nature of the hazards associated with fracking, coupled with the concerns and uncertainties about the regulatory system, indicate that shale gas development should be halted until a more detailed health and environmental impact assessment is undertaken. The Medact report has not produced new epidemiological research but has reviewed published literature and has requested short papers from relevant experts in particular subject areas. It has also interviewed academics and experts. Unfortunately, one of the contributors (contributing to three of the report's six chapters – chapters 2, 4 and 5) has led a high profile campaign in the Fylde related to shale gas. Another contributor to the report (chapter 3) has previously expressed firm views on shale gas and has objected to this application. This has led to questions from some quarters about the report's objectivity.In light of these uncertainties it is not clear how much weight the County Council should attach to the report. ^ "Shale Gas Production in England – an updated public health assessment". Medact. Retrieved 27 February 2017. Key points. Hazardous pollutants are produced at all stages of the shale gas production process. The range of pollutants are outlined in the report. Based on current evidence it is not possible to conclude that there is a strong association between shale gas related pollution and negative local health effects. However, there is clearly potential for negative health impacts. In particular, there are risks of (i) adverse reproductive outcomes due to exposure to endocrine disrupting chemicals, (ii) risk of respiratory effects resulting from ozone and smog formation, (iii) stress, anxiety and other psycho-social effects arising from actual and perceived social and economic disruption. ^ Clark, Pilita (7 July 2016). "Fracking threatens UK's climate change targets, says report: Government's advisers on global warming urge industry to adhere to three conditions". The Financial Times. Retrieved 29 December 2016. Separately, a group of medical professionals repeated their call for the UK to abandon its shale gas plans because of the threats it posed to health. A report from the London-based Medact charity said risks included reproductive problems from exposure to endocrine-disrupting chemicals and respiratory damage from smog. ^ "Fracking fears over gas drilling in Vale of Glamorgan". BBC News. 26 September 2011. Retrieved 27 February 2012. ^ a b c Peter Collins (9 December 2011). "New bid to drill for gas in the Vale". South Wales Echo. Retrieved 4 March 2012. ^ "'Fracking threat' to Bath's hot springs, says council". BBC News. 28 September 2011. Retrieved 26 February 2011. ^ "Wrexham public meeting over gas test drilling plan". BBC. 15 October 2013. Retrieved 15 November 2014. ^ "Company documents contradict Miller's 'We have no intention to frack in Balcombe'". Gas Drilling in Balcombe. NO Fracking in Sussex. 13 January 2012. Retrieved 29 February 2012. ^ Fiona Harvey (23 January 2014). "Cuadrilla scraps plan to frack at Balcombe site: Natural fractures in shale rock rules out need for hydraulic fracking, company says". Retrieved 20 March 2016. ^ "Letter reveals Cuadrilla "had to frack Balcombe area of the Sussex Weald to be commercially productive"". 8 May 2014. Retrieved 20 March 2017. ^ James Melley (28 September 2011). "New groups protest at shale gas". BBC News. Retrieved 2 November 2011. ^ "Residents Action on Fylde Fracking &#187 Blackpool & Fylde Coast". ^ "Ribble Estuary Against Fracking - News". Reaf.org.uk. Retrieved 4 March 2012. ^ "Help us say NO to toxic gas drilling in the Vale of Glamorgan". The Vale Says No!. 8 November 2011. Archived from the original on 13 May 2011. Retrieved 4 March 2012. ^ Grafton, R. Quentin; Cronshaw, Ian G.; Moore, Michal C. (2016). Risks, Rewards and Regulation of Unconventional Gas: A Global Perspective. Cambridge University Press. p. 177. ISBN 9781316869888. Retrieved 20 March 2017. ^ Shale gas. "Frack Off". Retrieved 22 December 2016. ^ "Pro-frackers launch drive to get people behind shale gas drilling". Johnstone Press. 2 June 2015. Retrieved 24 December 2016. ^ Harvey, Fiona (24 April 2013). "Cuadrilla censured by advertising watchdog over fracking safety claims". The Guardian. Retrieved 5 September 2016. ^ "ASA Ruling on Cuadrilla Resources Ltd". Advertising Standards Authority. 24 April 2013. Archived from the original on 28 April 2013. Retrieved 5 September 2016. ^ Merrill, Jamie (6 January 2015). "Anti-Cuadrilla group's fracking protest leaflet misleading, says watchdog". The Independent. Retrieved 5 September 2016. ^ "Informal ruling on Residents Against Fylde Fracking". Advertising Standards Authority. 7 January 2015. Retrieved 5 September 2016. ^ "Friends of the Earth accused of 'misleading' over fracking". BBC. 19 October 2015. Retrieved 5 September 2016. ^ "Complaints to ASA and FRSB about Friends of the Earth fracking leaflet". 20 October 2015. Retrieved 20 March 2016. ^ "Friends of the Earth ticked off over claims in anti-fracking leaflet". The Guardian. 4 January 2017. Retrieved 27 February 2017. We approached Friends of the Earth with the concerns that had been raised about its ad," said a spokesman for the ASA. "The advertiser agreed not to repeat the claims, or claims that had the same meaning. On that basis we closed the case informally. The ad must not appear again in its current form." ^ Parker, Guy. "Opinion piece: A fractious debate but a clear outcome". Advertising Standards Authority. Retrieved 27 February 2017. We told Friends of the Earth that based on the evidence we'd seen, claims it made in its anti-fracking leaflet or claims with the same meaning cannot be repeated, and asked for an assurance that they wouldn't be. Friends of the Earth gave us an assurance to that effect. Unless the evidence changes, that means it mustn't repeat in ads claims about the effects of fracking on the health of local populations, drinking water or property prices. Friends of the Earth has said we "dropped the case". That's not an accurate reflection of what's happened. We thoroughly investigated the complaints we received and closed the case on receipt of the above assurance. Because of that, we decided against publishing a formal ruling, but plainly that's not the same thing as "dropping the case". Crucially, the claims under the microscope mustn't reappear in ads, unless the evidence changes. ^ Bennett, Craig. "Let's talk about the fracking facts". Friends of the Earth. Retrieved 27 February 2017. ^ a b Peter Collins (21 October 2011). "Delight at refusal of shale gas test drilling". Western Mail. Retrieved 4 March 2012. ^ Peter Collins (22 October 2011). "Gas drill bid firm considers legal action". South Wales Echo. Retrieved 4 March 2012. ^ Peter Collins (25 November 2011). "Fracking firm considers legal action against Vale Council". South Wales Echo. Retrieved 4 March 2012. ^ a b Peter Collins (27 February 2012). "Campaign against Vale of Glamorgan gas drilling plan suffers setback". South Wales Echo. Retrieved 4 March 2012. ^ a b Fiona Harvey (20 April 2011). "'Gasland changed everything' – fracking firm battles to woo English villagers". Guardian.co.uk. Retrieved 27 February 2012. ^ Tim Rayment (23 October 2011). "The wonder gas that could cut your energy bills". The Sunday Times. Retrieved 5 March 2012. ^ Fiona Harvey (20 April 2011). "Shale gas: is it as green as the oil companies say?". Guardian.co.uk. Retrieved 28 February 2012. ^ "Shale Gas:Rural Economic Impacts" (PDF). Retrieved 6 March 2019. ^ "DEFRA cover letter" (PDF). Retrieved 6 March 2019. ^ Mason, Rowena; correspondent, political (10 August 2014). "Fracking campaigners criticise 'censored' report on house prices". Retrieved 6 March 2019 – via www.theguardian.com. ^ "Friends of the Earth ticked off over claims in anti-fracking leaflet". 4 January 2017. Retrieved 14 March 2017. Other claims made in the ad, entitled "Pat saved her home from fracking. You can save yours too", included that there would be "plummeting house prices"
DECC:6 Aug 2015 - 1. What is shale gas?